A recent study revealed that nearly half of Canadian consumers would share personal information, such as location data and lifestyle habits, if it meant receiving more personalized and efficient products and services. The Financial Services Consumer Study, conducted by Accenture, surveyed 47,000 banking and insurance customers across 28 countries in 2018; of the total surveyed, 2,000 were Canadian. More than three-quarters of all respondents to the survey indicated that they would be willing to share data for discounts and competitive pricing. The report split respondents into four categories: pioneers, pragmatists, skeptics, and traditionalists. Pioneers are listed as tech-savvy consumers, geared towards innovation. Pragmatists were defined as consumers who see technology as a means to an end, rather than a passion. Skeptics, tech-wary and generally dissatisfied with financial providers. Finally, traditionalists were listed as tech-avoiders, and usually of an older age group, according to the study. Worldwide, more than three-quarters of all respondents to the survey, no matter their category, indicated that they would be willing to share data for discounts and competitive pricing. The study specifically looked at consumers sharing data with banks and insurance companies. It found that although Canadians would be willing to exchange data for benefits such as more efficient, relevant products, lower prices, and more personalized offers, the majority maintain the importance of privacy. About 72 percent of those surveyed report being cautious about the privacy of their personal data. When asked what would make them leave their bank or insurer, consumers cited data security breaches and increasing costs. 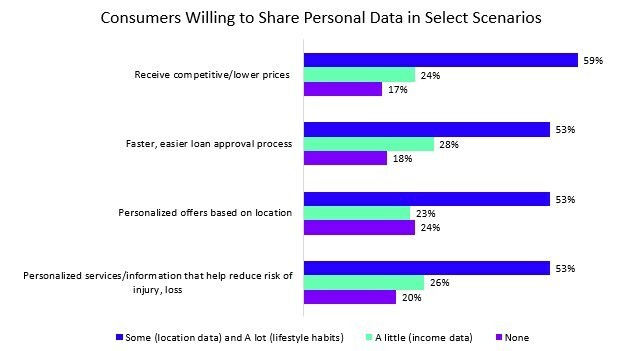 Those surveyed stated they were most likely to exchange location data, lifestyle habits, and income data in order to receive competitive or lower prices, followed by a faster loan approval process, personalized offers based on location, and finally personalized services that help reduce the risk of injury or loss. While Canadians seem willing to share their personal data, Canadian companies using that data may not have the knowledge or tools to properly handle that sensitive information. A report last year found that almost 40 percent of Canadian companies surveyed said they were unfamiliar with Canada’s federal privacy law, PIPEDA, which governs how businesses handle personal information of customers. The Canadian Internet Registration Authority’s (CIRA) 2018 cybersecurity survey found that while 78 percent of companies said they were confident in their level of cyber threat preparedness, 37 percent admitted that they don’t have anti-malware protection installed that could help protect consumer data. The Accenture report stated that customers seem to believe the more information a provider can collect about a consumer, the easier it is to provide tailored products and services, along with more competitive pricing. 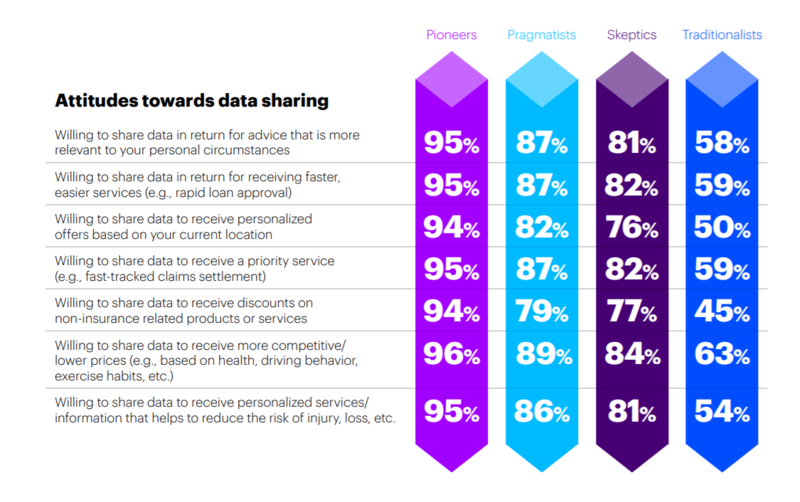 However, the willingness of data-sharing often depends on the type of consumer as well as the benefit being offered. Pioneers were the most likely group to exchange their data for benefits, whereas, it comes to no surprise that, traditionalists were more opposed to the idea of sharing data. It is suggested in the report that banks should consider creating stronger incentives to encourage customers to share their data. It noted that over time, consumers are likely to expect greater innovation in return for their data. The use and sharing of personal data has become an increasing concern over the past couple years, with governments and policymakers taking note. Last month, the Ontario government announced plans to seek public input on a new data strategy, which focuses on helping businesses benefit from the digital economy, while making data privacy and protection a top priority. The province says it hopes to build a data strategy to prepare Ontarians and Ontario businesses for “the rapidly advancing era of Big Data”. In 2018, the federal government also announced its intention to develop a national data strategy, setting aside $572.5 million over five years in Budget 2018, however, mention of the data strategy was notably lacking in yesterday’s 2019 federal budget announcement. With more focus and changes to national and international consumer data privacy laws VCs are also more increasingly asking startups about their data and privacy management policies; a change from last decade’s focus on investing in companies that can quickly collect and monetize data. Accenture’s report found that on a global spectrum, a total of 81 percent of consumers are still willing to share income, location, and lifestyle habit data for rapid loan approval. And more than three quarters are willing to do so in order to receive personalized offers based on their location. Global consumers, for the most part, are in favour of receiving premiums in exchange for lifestyle information. Over half of global consumers, 64 percent, showed interest in adjusted car insurance premiums based on safe driving. About half of consumers would like life insurance premiums tied to a healthy lifestyle. Four in five consumers would provide income, location, and lifestyle data to their insurer if they believed it would reduce injury or loss. However, consumers’ willingness to share data varied around the world. In China, 67 percent of consumers were willing to share data in exchange for more personalized services, compared to 50 percent in the US. In Europe, consumers were more skeptical. The General Data Protection Regulation, the primary law regulating how companies protect consumer data, was implemented in May last year. Only 40 percent of consumers in the UK and Germany found themselves willing to share data in return for personalized services. Heyo, Sera here. I love infographics, organizing data, and making lists. I’m an avid lover of cats. Please send cat pics my way at @Sera_wong on Twitter.